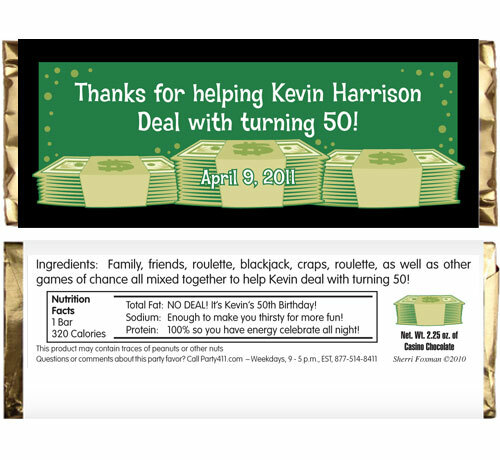 Party411 - Casino party supplies to make your party a winner! Casino theme parties are great fun; a chance to dress up and party in style. We have the casino party supplies, decorations, favors and props you need for a successful party. If you need some ideas for your theme party visit any of our casino theme parties. Show your guests what a special party this will be with personalized invitations and favors. You customize the wording and make it unique for your casino theme party! Paper goods will tie your theme together. You can't go wrong with the playing card color scheme of red, black and white! Casino decorations are easy and fun. Poker cards, money, chips and dice... use them all! Your guests will feel like high rollers at your casino. The best part of a casino party is dressing up and having fun! Give your guests a few fun wearables for them to don while they play the games. Scatter poker chips on tables as confetti and put out decks of cards so guests are encouraged to start up an impromptu game. Use poker cards as seating cards! Use white label stickers and permanent markers to mark the names on the cards, and prop them up on the table with dice. Balloons point guests to the most important areas of your party. For a casino themed party, group red, black, and white balloons together in odd numbers. Then, hold them down with dice balloon weights. Cover tables at your party with green table clothes to remind guests of craps and poker tables. Set up a game room with casino game favorites, like craps, Texas Hold 'Em, and blackjack. Provide guests with a set amount of fake money, and have a prize table (gift cards, lottery tickets, small gifts) where they can turn in their hard won cash for some loot. Show guests to their seats with table signs commemorating big gambling cities, like Las Vegas, Atlantic City, Reno, Monte Carlo, etc. Include an iconic picture of each place along with its name.